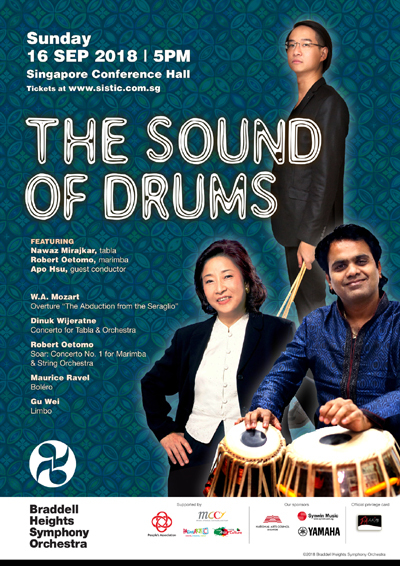 Celebrating the multicultural musical tapestry of Singapore, the nation’s finest percussion virtuosos will take centre stage to create a powerful and energetic East-meets-West experience featuring traditional and contemporary styles. The program will also feature “Limbo” by young Singaporean composer Gu Wei. Led by renowned Taiwanese conductor and pedagogue Maestra Apo Hsu, this rarely heard and highly imaginative program aims to break the traditional mould of classical music concerts through intercultural collaboration and by showcasing our ethnic musical traditions, which will attract a larger, more diverse audience into the concert hall.